Perfect storage units! These boxes really helped organize my room. Honey-Can-Do OFC-03704 Hinged Lid Storage Box, Espresso. 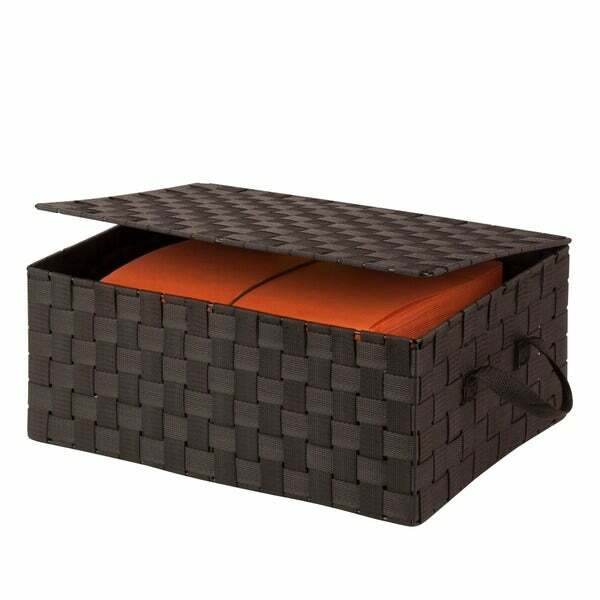 Clear the clutter with this hinged-lid storage box in contemporary woven strapping. Measuring 17 inches long x 12 inches wide and 7 inches high, this storage solution provides ample space for stashing odds and ends. The durable woven strapping will stand the test of time and add a unique look to your home or office. Coordinates with other pieces in Honey-Can-Do's collection of double woven products. This is just right for what I needed, but the so-called "hinges" are nothing more than a couple of strings tied through the lid and box!! This is ok, I was expecting it to feel a little more high end storage box decor. The material is kind of soft so you can't stack anything on top of it. Would work well for storing stuff in it and them sliding under a couch or bed. Nice product but what arrived was without a lid. I kept but not what I ordered. I love the fact that it holds a lot of my sweaters and that"s why I am back to buy another""
Well made. Look great on my open shelves. Just what I have needed to store things that I don't use all that often.